Your life is a result of the choices you make. If you don’t like your life, it’s time to start making better choices. 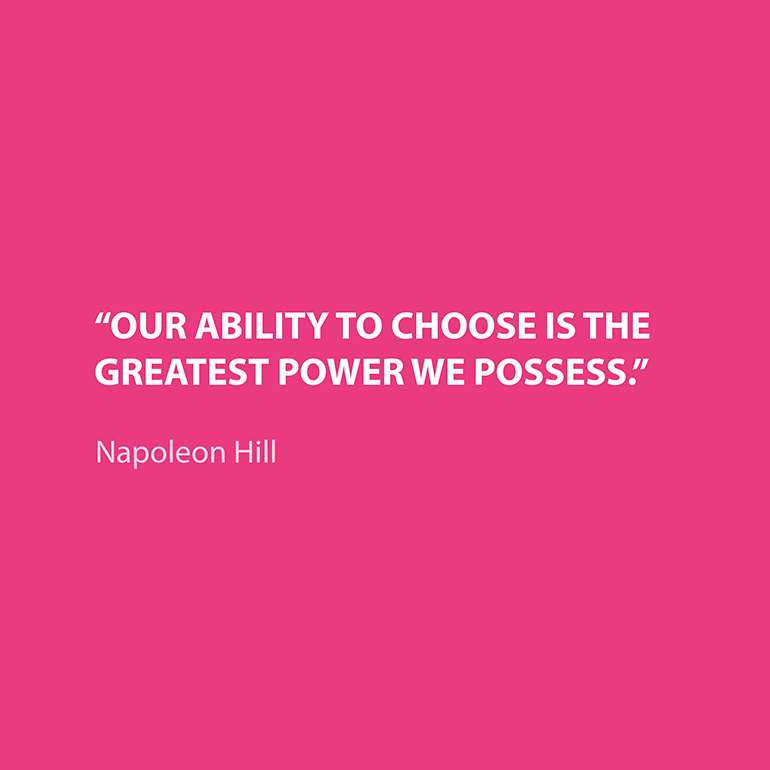 Our ability to choose is the greatest power we possess. In any given moment we all have the power to change our mind and choose again. What we choose is always what we believe to be true but more often than not that truth is distorted by the limitations that fear would have us believe we are restricted by, be it emotional or physical. Most choices we encounter on a day-to-day basis are the flip side of either weakness i.e. fear / ego / the devil that sits on your left shoulder or strength i.e. guidance / universal energy / the angel that sits on your right shoulder. Simply by not allowing weakness to direct our actions, we take away its power and give charge to the inner strength that always resides within us all. Remember that every choice we make establishes our own identity. Therefore contemplate the person you want to be when choosing that job or relationship. Think about the social circles you choose to move in and the activities you choose to entertain yourself with. Do they all represent the person you want to be ? If not choose again. Choose to see a situation differently. Consider every choice as another opportunity to transform your life by breaking old emotional patterns, unlearning destructive habits, giving up addictive behaviour and above all letting go of the past. There really is a positive to every negative. Forgive yourself for making a wrong choice. Don’t berate yourself for making a so-called wrong choice. It’s OK – we all make mistakes. Your soul has an agenda that is beyond your human control. You are going to learn the same lessons your soul needs to learn no matter what you choose. It’s just up to you how you go about the learning process. Therefore witness the misjudgment then instantly forgive yourself, and whilst you’re at it forgive the weakness in others too. We are all walking this journey of self-discovery called life together, just at different speeds. When it doubt choose love. If faced with a moral conundrum and unsure of what choice to make always choose what lights you up, overwhelms you with joy, makes you smile from the inside out and will make you proud of being you. As all these desires are based on the only thing that is guaranteed to be real – love. So I encourage you to be true to yourself. Be brave and choose again.